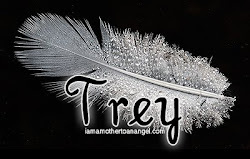 Now you can read the journals I kept during the first year after we lost our son Trey. I reached out to a new Angel Mommy yesterday, and I mean "new" as in her baby went to heaven on New Year's Day. It breaks my heart to know someone else has to endure such heartache. My husband and I always say that we are a part of a club that NO ONE wants to be a part of and we never asked to be in this club, just landed here by default. Thankfully, this new Angel Mommy got back in touch with me, I am SO hoping I can be there for her the way my Angel Mommy friends were there for me. 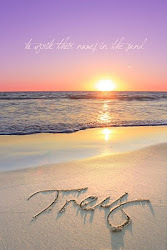 I encouraged her to write about her experience and healing and was so proud and excited when I saw she had posted a blog, a message to her sweet angel. Tonight I was listening to Sarah McLachlan while I was winding down for the night and the following song REALLY made me think of this new Angel Mommy. The lyrics speak volumes and give a voice to the depths of despair parents and families of baby angels go through. Even though it brought me back to a very dark place in my heart and mind, this song reminds me of how I felt being new to the club and hopefully returning to that perspective will help me be a good support for her. Had a meaningful chat with an Angel Mommy yesterday, who I didn't know was an Angel Mommy. 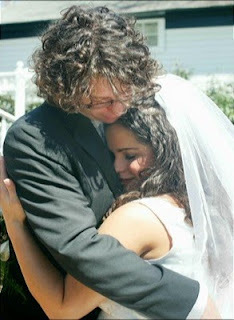 She shared her experience of pregnancy after her loss and how she and her husband coped. It's always a bittersweet moment to find out someone is an Angel Mommy, bitter because you never want to hear of yet ANOTHER person having that kind of nightmare and heartache, and sweet because they are willing to share their experience with you and allow you in so you can support each other. Usually conversations with other Angel Mommies don't journey too much into the topic of my husband or my marriage, so this one was a new one for me, but it was welcomed. She shared that she too was riddled with the same emotions I am feeling throughout the pregnancy after her loss. She went on to relay how her and husband had to come to a point of accepting things as they were and trying to (without putting words in her mouth) enjoy the pregnancy with as little stress and anxiety as possible. I am sure it wasn't easy to remember those days so that she could relay them to me, it never is for Angel Mommies, but we do it so that we can reach out to others, if only to help them hurt a little less. At least that's why I share my experiences with other Angel Mommies, we know our own hurt and would do ANYTHING and EVERYTHING to take even a speck of hurt away from other Angel Mommies by being there for them and sharing our experiences. I am so glad she came to talk to me, not only because no one has ever shared with me any insight on getting through this with my husband and marriage, but also, it gave me pause to really think about where my husband and I are with our emotions regarding this pregnancy. I am so proud of her and her husband for coming together and choosing to get through their pregnancy with their chins up, no matter how difficult that must have been at times (I would imagine). Often, I write these things down and leave them on the page, which most of the time is a good thing. It wears me down keeping these emotions and realities inside and to get them out in this format allows me to release them. Yet, sometimes when I release, I owe it to myself to revisit and re-evaluate where these emotions and realities stand and how are they changing if they are at all. The conversation with my fellow Angel Mommy forced me to think about where my husband and I are emotionally and relationship wise at this point in the pregnancy and how far we have come, if at all. From the very moment that pregnancy test came out positive, my husband and I felt a joy that hadn't been present in our hearts in lives since we were expecting our son Trey. Our first pregnancy, for the most part, was footloose and fancy free (had to Google that phrase to make sure I said it right, I REALLY wanted to use it because it certainly describes our situation). For six months we had not a worry in the world, excitably awaiting the arrival of the child we had wanted and tried for for years. We spent each day of the pregnancy planning for and dreaming of a life with our beloved son. It was one of the happiest times of our life together. One would expect for all sequential pregnancies to be blessed with the same happiness. This pregnancy, however, began on heels of an emotionally scarring time for my husband and I. This child was created with the deep love of a devoted husband and wife, whose hearts, though together in love always, were shattered to the tiniest of pieces when we lost our son. Yet in time, these two hearts picked up the pieces and put them back together again, even helping each other pick up the pieces and put them back into place. Through our celebration at our second pregnancy, we retreated to our respective emotional corners, holding the same worries, the same fears, the same anxieties, and worst of all, the same nightmares and horrible memories of a joyous pregnancy gone terribly wrong and the life of an innocent cherished child lost. We stewed there, in our corners alone, yet celebrated together for quite some time. For someone like me, who has been know to be forthcoming, sometimes to a fault, with my thoughts and emotions, this was a torturous time and an emotional spiral I had no idea how to get out of. My husband, ever the strong man, maintained a certain element of strength as to be strong for his unborn child and his wife. No doubt, it was just as hard for him to process all that was involved with this pregnancy on his own. When I could take it no more, I forced the conversation. We FINALLY aired out our fears, worries, and anxieties surrounding this pregnancy, having to unfortunately relive the nightmare that was our son's birth and untimely passing. It took this conversation to remind us of the sole reason we got through our son's death, we went through EVERYTHING together. There was not an emotion we did not talk through, and though we were seldom left alone with our own mourning, there were hardly any tears that weren't shared together. Every step of that horrible journey, we were side by side, even making sure that the other was never alone. John used all of his off days and devoted them to keeping me from being alone during maternity leave. I remember worrying about him to no end while he was at work and not being settled in my heart until he was back at home and we were together. We were a united front facing our grief and took it one at a day a time together. Our love grew through our pain and marriage became stronger as we healed from our tragedy together. The common threads were togetherness and love, and that was the only way we would get through all the emotions and anxieties during this pregnancy. We remembered how we got through the hardest time that any parent or married couple can ever imagine together and in tact and we concluded that together we can weather the ups and downs of this pregnancy and hopefully get to a point where we can start each day together with a deep breath and more peace in our hearts than the day before. We decided that the only way the dark emotional clouds will clear is if we are open and honest with each other about EVERYTHING so we never have to go at it alone. We can't pretend that this is the typical second pregnancy, but we can strive to celebrate every moment of this pregnancy and get through the bumps in the road together. We might not be at a point where we can always forget our worries, come on get happy, but when we hold our child in our arms for the first time, we can look back and remember with fondness how, once again, we did it together, through thick and thin, better or worse. As for myself, I have expressed all that I think and feel, it's all truth and reality in the moment. As these moments come and go, and we pass each milestone with flying colors and encouraging news, I am able relax that more and focus on the joy that is this pregnancy. The emotions and worries will be there, hopefully lessening in capacity, but these weeks will turn in to months and before I know it, we will be loving on a child created with and surrounded by love. But most importantly, I will not be alone, the baby and I will have the WORLD'S BEST DADDY (and husband) and our own personal guardian angel by our sides...as long as we both shall live. Last Sunday, Georgia watched in awe as Mother Nature dumped a blanket, make that a mattress, of snow across the state. 5 days later, we are finally starting a relevant thaw out and getting back to life as usual. 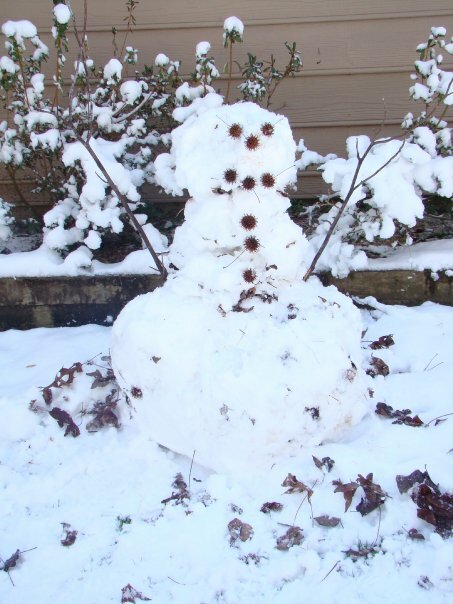 In the process, most counties closed schools for the week and many businesses were delayed or closed due to hazardous conditions on the roads. This included some healthcare facilities, specifically mine, causing me to have to cancel my first OB appointment on Wednesday. I was actually looking forward to this appointment, as it was the jumping point from which my records would be reviewed, Ob care would continue where it left off, and perinatal referrals would be made. Ever since we switched insurance companies at the beginning of 2011, I have been anxiously awaiting this first appointment, as it ensured the continuation of the extensive care the baby and I were receiving before the new year. Canceling the appointment was no big deal, the facility was closed and the drive too dangerous. Upon rescheduling, the closest appointment was nearly two weeks after my initial appointment. The appointment was scheduled much to my dissatisfaction and anxiety. The date of the appointment would mark over a month since I had last seen a doctor and I was much less than comfortable with that. Before the new year, I didn't go two weeks without seeing a doctor, even for the short time between the beginning of my care and the new year. A whole month was absolute torture, as I wouldn't get to see/hear the baby or get confirmation that everything was going smoothly until over a month after my last appointment. My husband and I maintained our sanity thanks to continuous input from frequent appointments and were expecting the same care with our new doctors. After a bit of an emotional breakdown, I gave myself a night to sleep on it and calm down enough to think my feelings through. After a horrible night's sleep, I came up with two conclusions. 1. After all that we have been through, I have every reason to be on edge concerning my healthcare and insist on immediate care. 2. As a new patient to both the facility and the insurance company, they have no idea how high risk this pregnancy is, nor do they know my health history. I had no idea what medical records had actually gotten to them even though they were sent to them before the new year. So, under the advise of a very good friend inside the insurance company, I called the insurance company again and, trying to keep as much composure as I could muster (which wasn't much), I explained to the advise nurse my concerns about the delayed appointment and gave her a brief history of my last pregnancy. I assured her that I wasn't trying to be a pain or a neurotic pregnant lady, just a Mommy who has been through the worst and wants the most immediate care possible. She patiently took notes and suggested a consult with an OB the next day to review medical history and set up any perinatal referrals necessary. I happily agreed and apologized for my emotionality. To that, she assured that it was a good idea to call in and she would have done the same thing if it were her. EXHALE!!!! During the consult the next day, after the doctor cleared a confused nurse out of the room, (she wasn't quite why I was there if not to get regular OB check-ups done) the OB and I discussed Trey's condition and birth as well as my maternity care up to this point with this pregnancy. She wondered out loud why I had not been seen earlier. As I suspected, all of my records had not been received yet, most likely still in the offices of the perinatal doc to whom they had been sent. From the records that she received, she agreed that this pregnancy should continue to be treated as high risk and the perinatal referral needed to be made immediately so that I could continue to be under the care of both an OB and perinatal specialist. Then, it was as if she read my mind, she got out the Doppler device to listen to the baby's heartbeat. It took her a few moments to find the heartbeat, during which time I am pretty sure I did not take a breath. After a few moments of wrestling the wiggly 4 inch long baby inside me, she was able to zone in on the heartbeat. I listened with delight and relief to the music that was our baby's heartbeat. EXHALE!!!!!! (and smile REALLY REALLY BIG!!!). The appointment ended with her thanking me for coming in to consult with her and assuring me that both the OB and the perinatal offices work closely together concerning patient care. I thanked her for taking time with me and I was again validated for calling in to make the appointment when she told me that after all that I just told her, she didn't blame me for wanting immediate care. EXHALE!!! I must say that I am more than pleased with how my treatment has started out. I am glad that I acted as an advocate for my health and the health of my baby. The way I went about it was respectful and dignified. So often, I have just accepted and trusted how my healthcare was being handled, stifling my real feelings and concerns, but after all we went through with our son and our last pregnancy, I can no longer sit back and let what I feel is in the best interest remain silent. I feel empowered by my recent experience to encourage everyone to be an advocate for their own health and the health of their loved ones. It worked to my advantage this time, and even though I might not get what I want every time, I know that by asking questions and seeking information I am educating myself which is another way of being one's own advocate. Being "snowed into a corner" forced me to find my voice and respectfully ask for what I know the baby and I needed instead of simply accepting the appointment given to me and the distress it would cause me. The end result, peace of mind and quality care, definitely worth the life lesson. EXHALE!!!!! 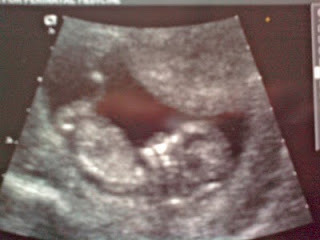 Today marks the first day of our second trimester, can't believe it!! This pregnancy is going at the speed of snail, scratch that, think of anything slower than a snail and it is still slower than that. Yes, we are past the "danger" zone, or are we? 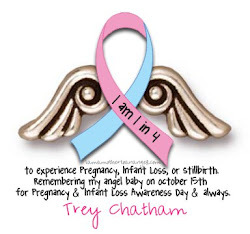 Most of the Angel Mommies I know lost their precious babies in the second trimester and still a large percent of the others lost their baby angels right before or right after they were born. I guess there is uncertainty throughout, yet I keep thinking that Trey picked out this baby especially for us, a perfect baby that will enrich our lives for more years than we can count. I bet he was just as anxious as we were for the right time and baby to come along. We start the second trimester with very good odds against Down Syndrome, Trisomy 18, and Trisomy 13. 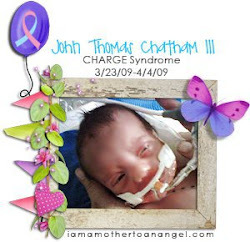 CHARGE Syndrome cannot be tested at this time but we are assured that the baby will be tested, though we know the probability is far too slim for it reoccur. No doubt we will get more information on what will be tested during this trimester. SOOOOOOOOO not looking forward to the glucose to test that tests for blood sugar levels. But, at this point we will take any and every test that is necessary to ensure the health of our child. We also start this trimester with new insurance which means new doctors. The good news is that my old doctors are insisting that I see perinatal specialists, not a regular OBGYN, which makes us happy because we know that the baby and I will be closely monitored at all times. I would have it no other way. Also, the perinatal OBGYN that I will be seeing comes highly recommended by two VERY close friends and every medical professional I have come across who hears that we will be under his care. We also will be delivering at the hospital of our choice. Starting over with new doctors is rather nerve racking for me, I had to start with new doctors at the beginning of last year. Rehashing all of my medical files and experiences is heartbreaking, like reliving the nightmare. There's always more explaining to do, places on forms that I am filling out to indicate past pregnancies or hospital stays, then more questions about that. I am hoping not to have to do too much rehashing, that my files will tell our story. My former OBGYN has also spoken to the Perinatal OBGYN about our situation, so I am praying for an easy transition into new healthcare. Still, I am grateful. I know too many that are still struggling to get pregnant with their first and I, despite the struggle, and blessed to be pregnant again within two years. I couldn't imagine never being pregnant. 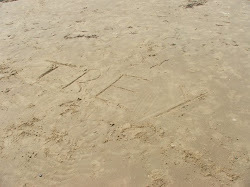 I would not trade my time with Trey, no matter how tragic, for anything in the world. Neither would I trade this emotional roller coaster of a pregnancy. I can only imagine how painful it would be to never have the experiences at all, to never have life grow inside of me, especially if it is what I yearn for with all my heart. The time between my pregnancies was the most painful time for me as a mother. I had given birth but had no baby to show for it. With each passing month with no positive pregnancy test, my arms seemed emptier and emptier. Now that we are expecting again, I often think about those around me that still have empty arms, whether they have lost a child or are still waiting for the blessing of their first. My only wish is that they too have a personal angel that is waiting for the perfect baby to send to them. Throughout this pregnancy, lots of kind folks have ensured me that everything will be ok with this pregnancy and this child. It's hard to accept these words of encouragement especially since I heard the same things from some of the same people that my last pregnancy and our son would be ok. It's not that I don't trust their sentiments or their intentions, but when I hear these well meaning sentiments, I can't help but ask in my head "HOW DO YOU KNOW?" How does anyone know that everything will be ok? How does anyone know how all of this will turn out. I certainly hope everyone is right, but I cannot take anyone on their word that everything will be ok because no one is in control of this situation, not even John and I. 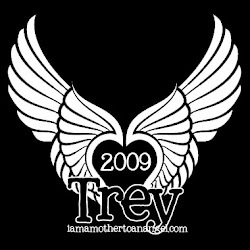 All we have is the hope and faith that we scraped back up after Trey died and the love that surrounds us. Hope, faith, and love are real as long as you believe in them and have them in your heart and soul. 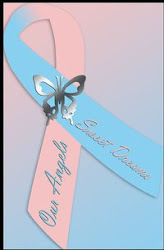 Over the last two weeks, I have had a lot of time to talk to my fellow Angel Mommies and find new support sites. Through these interactions, I am able to uplift other mothers and also unload my fears and worries about this pregnancy. These mothers know the struggle I face everyday, trying to keep my chin up regarding my son Trey and also juggling so many conflicting emotions surrounding this pregnancy. We share our experiences and our feelings and eventually it leads to us telling our entire tragic saga. We share pictures and journal entries. 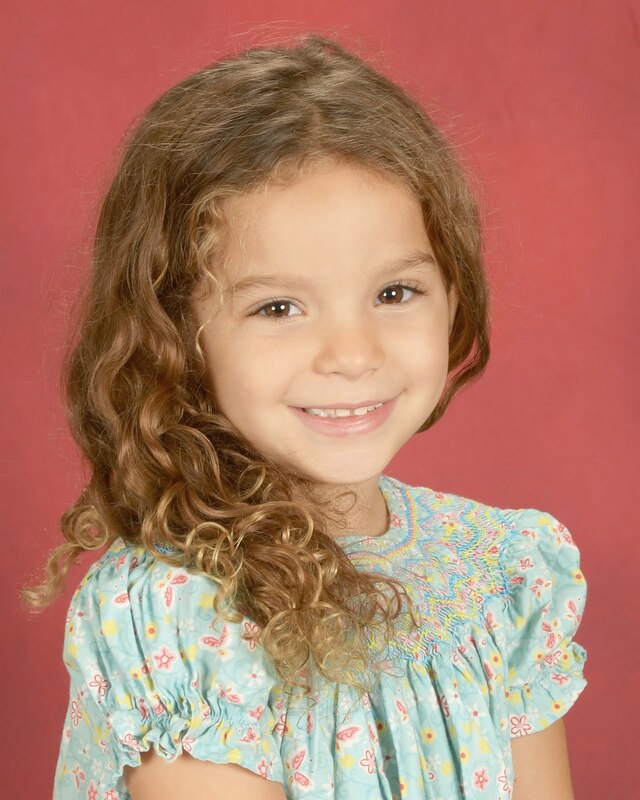 We brag about the strength of our little ones and come to envision the beauty that is our angels in heaven. 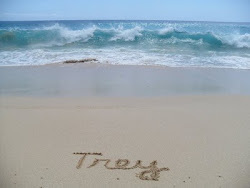 In these times, I find myself looking at the same picture of Trey that I consider my favorite. 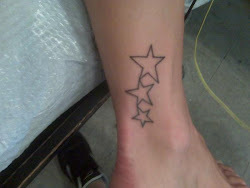 It was taken April 1, 2009. Trey had been in the NICU for nine days and we got the call at home that there was a long awaited bed for Trey at the local Children's Hospital where Trey would have the majority of his special care. We were overjoyed to say the least. As they prepared him for the ambulance ride to the Children's Hospital, he opened his eyes. The nurse hurried me over to take a picture because Trey always turned camera shy when his eyes were open and he would shut them quickly. I did not know then that that would be the last time I saw his eyes open. The day had started off so encouraging with the trip to the Children's Hospital and our little boy looking into my eyes, you could not shut off my smile or stop my heart from beaming. We were on our way with our son to a place where Trey's condition would be treatedmand his needs could and would fully be met. Our son had the Cadillac plan of healthcare awaiting him, it was the first step to seeing our little boy healthy and thriving. The events of that morning carried me through the ride to hospital in the ambulance, the LONG day of testing and doctor's consulting together, and the even LONGER night before they would sit us down to weigh out the options. 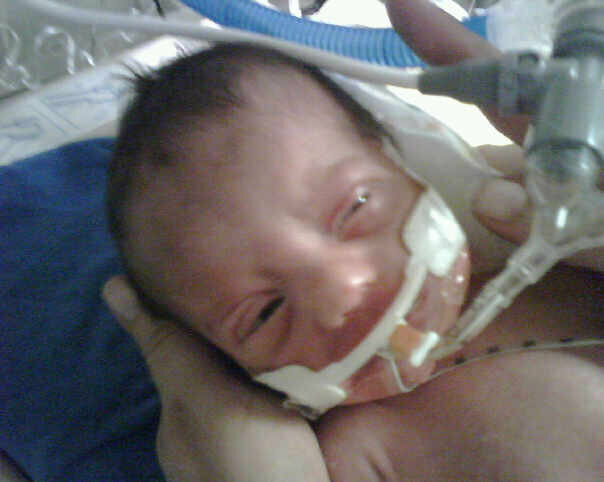 Throughout our long day and night I stared at the last picture I took of him with his eyes open looking at his Mommy. I saw hope, faith, strength, and love in those eyes and could stand strong knowing that everything was going to be ok.
Needless to say, when the doctors sat us down the next morning and over the next three days, their findings zapped the hope and faith right out of us. 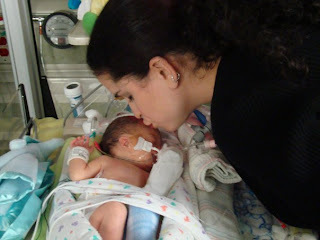 Our son was slowly dying and had been since birth. We learned that the previous hospital had not disclosed everything to us and led us to believe that Trey's health was stable, if not improving. On April 4th, 2009, we said good-bye to our son and released him from the prison that was is health. It wasn't until the past few weeks that I really revisited the picture, the story behind it, and what it means to me. I still see hope, faith, strength, and love in those eyes and I always will. 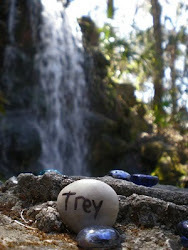 The picture represents a time of the greatest joy for us in Trey's short life. I can only imagine that Trey opening his eyes that last time was his gift to me that now serves as my inspiration. I keep the photo with me now and it comforts my worries and fears as we travel through this next phase of our lives, continuing on to parenthood. I am sure the worries and fears will always be there, but his angel eyes renew my hope and faith, remind me to be strong, and fill my heart with the love of a little boy, my personal guardian angel.